Show off your out-of-this-world skill with these bold neon soccer balls! 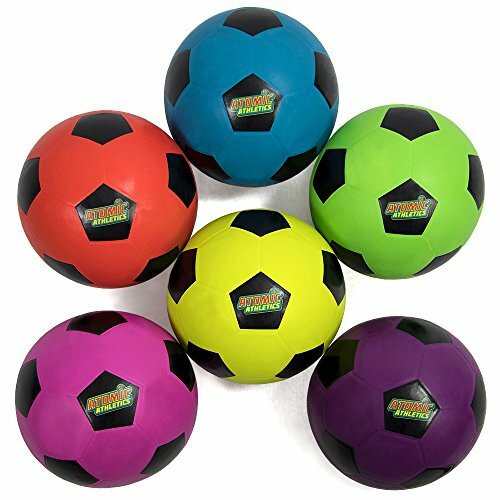 Each set of balls comes in six vibrant shades: Radioactive Red, Gamma Ray Green, Electric Blue, Ultraviolet, Proton Pink, and Stellar Yellow. These balls are regulation size 5, 8.5" and are great for teaching young players about the sport. This set comes with an air pump for inflating as well as a mesh storage bag. Our soccer balls are made of rubber material, perfect for playing on a soccer field, in the grass, or at a gym. You can use them for indoor and outdoor play.